On Wednesday 22nd October 2014, the House of Lords debated amendments to the Government’s Criminal Justice and Courts Bill during the second day of its Report Stage. 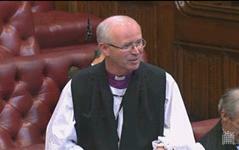 The Rt Reverend James Langstaff, Bishop of Rochester, contributed to the debate on Lord Ramsbotham’s amendment 108 to the bill, which was later withdrawn. The amendment sought to ensure that no secure college for young offenders could be established until clear rules on their operation had first been agreed. The Bishop spoke in favour of the amendment, highlighting the need to provide the highest standards of education for children in young offender institutions, especially when it had often been such a lacking feature of their pasts. We have heard, not least from the noble Earl, about the profile of the likely pupils in the establishment that we are talking about. It is admirable that we want to put education first and foremost in establishing the shape of this provision. However, we know it is vital that this particular group of potential pupils has the best possible educational experience provided for them because they have lacked so much in their pasts. Noble Lords will have different views as to the model for the best possible educational experience. For some, it might be an establishment on the banks of the Thames near Windsor; for others, it may be some other kind of establishment. But whatever it is, there is a sense in which we as parliamentarians are cast in this matter in the role of prospective parents, for it is in our name that the young people who are to be the residents or inhabitants of this institution are going to find their way there. Like good parents, we will want to view the prospectus. I remember the year I spent some time ago trailing around secondary schools in Birmingham seeking the right one for my daughter, and poring for many hours over the prospectus of various places. The prospectus may tell us some things about the physical environment—we have seen some plans and intentions and there have been some discussions about that—but of much more importance is what will happen each day and what the experience will be. Of course, in this instance that will be for 24 hours each day and for 365 or 366 days in the year. What will be the precise detail of the educational provision? How many staff will there be? What will be the skillset of the staff, and the mix of those skills? As has been referred to, what will be the discipline policy within this institution? What games will be played, and what other extracurricular activities will there be? As parents, one might also be concerned about issues such as the quality of the food which will be provided, and suchlike. Of course, the prospectus brings us into the realm not only of the rules which we are now discussing, but also of the terms of the contract. As good parents, it is wise of us to want to see as much detail as possible in this instance before we sign up to send our children to this particular place of education. I join other noble Lords who have made a plea that we might take things gently, and that even at this stage we might be allowed to see as much detail as possible, both of the rules and of the potential contract which is the subject of another amendment, before final decisions are made. We may then be able to exercise our quasi-parental responsibilities in this matter with confidence and assurance. The Bishop of Rochester also voted in favour of Amendment 111 to the Criminal Justice and Courts bill, which aimed to strengthen the Secretary of State’s obligation to provide young offenders with a secure place of detention following serious criminal activity. The amendment would have required an alternative resolution, drafted and approved by both houses, before the secretary of state could dissolve his obligation; rather than the simple need for either House to vote in favour of it being removed. The amendment was defeated by a vote of 191-178.